The Holy Spirit has written: For the grace of God that brings salvation has appeared to all men, 12 teaching us that, denying ungodliness and worldly lusts, we should live soberly, righteously, and godly in the present age. Thus far the text. Let us pray: Gracious Father, who by grace brings salvation that has appeared to all men, grant us to live Godly lives in the present age; in the name of Jesus. Amen. That first Christmas night, shepherds - living out in the fields, keeping watch over their flock - saw the angel of the Lord stand before them. And they were not just afraid; they were greatly afraid. The glory of the Lord does cause fear. Hidden sins come to out of the darkness. Hidden sins are brought into the Light when the glory of the Lord shines on sinners. Exposed sin causes fear. And rightly so. Thanks be to God, the angel said to them, “Do not be afraid.” There is no hiding from God. So thanks be to God that He came to those shepherd by grace. For the grace of God that brings salvation has appeared to all men. To the shepherd. To all people. Even to you. You live in this grace of God by faith in the Holy Babe wrapped in swaddling cloths, lying in a manger. 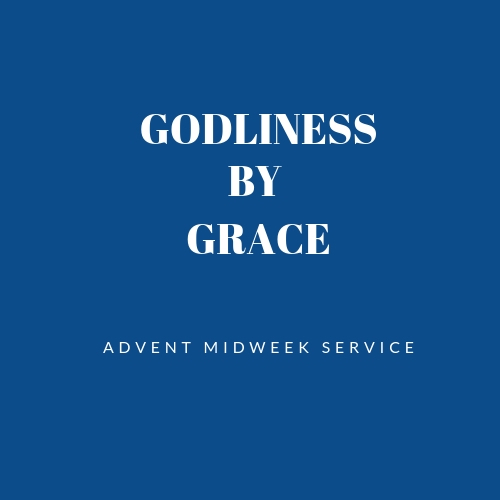 And that grace teaches us that, denying ungodliness and worldly lusts, we should live soberly, righteously, and Godly in the present age while we wait patiently for the second coming of Jesus Christ, our Savior. How is that done? How do sinners live Godly lives? How do you live a Godly life? First, believe in Jesus. He is your salvation. He appears to you in the hearing of His Gospel which give you faith. Gives you the forgiveness of your sins. Yes, you are a sinner but by the forgiveness of your sins in Jesus, you have peace. You have a good conscience before God and man. If you don’t trust Jesus; if you don’t trust that He alone is willing to save you and can save you from sin; then turn away from your unbelief and trust Jesus again. Your sins are forgiven. Don’t be afraid. Second, this grace of God that brings salvation, teaches you to begin living a God life in the present age. A Godly life is a life that doesn’t hurt others. A Godly life is a life that doesn’t take from others. For example, the patriarch Joseph. The one with the coat of many colors. The one thrown in a well by his brothers; the one sold as a slave in Egypt. Joseph believe in Jesus. He learned Godliness in Potiphar’s house. Potiphar trusted Joseph to care for whole household. His money and his wife. Potiphar’s wife was ungodly. She advanced on Joseph and Joseph ran out of the house. Thrown in jail by a disappointed Potiphar - but not put to death. Joseph believed in Jesus. He learned Godliness in prison. He was a model inmate and he even helped the jailers manage the prison. Interpreting dreams, too. For several years. Joseph believed in Jesus. He learned Godliness in Pharaoh’s court. Pharaoh didn’t trust Jesus but he trusted Joseph to care for all Egypt through a seven year drought. Many lives were saved by Joseph who, although he couldn’t save himself, trusted Jesus who can and wants to save all people. Joseph’s Godliness was a fruit of faith in Jesus. His Godliness was learned in the midst of great trials and over many years. And then one day, the Lord reunited Joseph with his father Jacob and even his brothers. That Godly man even showed kindness to his brothers who meant him harm so many years before. That Godly man desired to see the day of the promised Babe, wrapped in swaddling cloths, lying in a manger. Joseph desired to hear the angel voices sing Glory to God in the highest and on earth, peace, goodwill toward men! But you have God’s testimony. You believe in Jesus. You continue to be trained by the grace of God for living Godly lives in this present age even as you patiently wait for the second coming of your God and Savior Jesus Christ, who gave Himself for us, that He might redeem you from every evil and make you His own special people. Let no one despise you, for your faith or for your learning Godliness. Come quickly Lord Jesus. Amen.